Orfanedes, Paul Counsel for Amicus Curiae Judicial Watch, Inc. Judicial Watch public interest organization headquartered Washington, D.C. Founded 1994, Judicial Watch seeks promote accountability, transparency and integrity government and fidelity the rule law. furtherance these goals, Judicial Watch regularly monitors on-going litigation, files amicus curiae briefs, and prosecutes lawsuits matters believes are public importance. part its efforts promote fidelity the rule law, Judicial Watch has supported government policies and legislative enactments when finds such policies consistent with the rule law. Conversely, Judicial Watch has opposed such policies and enactments when finds them contrary law. particular, Judicial Watch has undertaken extensive research immigration laws, including the interaction federal, state, and local laws touching immigration issues and the doctrine federal preemption. Judicial Watch respectfully wishes share the results its considerable research with the Court filing this amicus curiae brief. 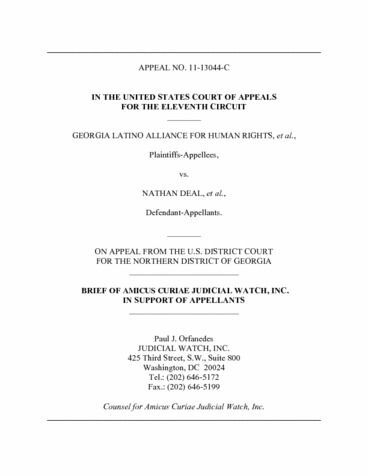 Although primarily for purposes assisting the Court, this amicus curiae brief supports the position Defendants-Appellants Nathan Deal, al. (Appellants) this appeal. All parties have consented the filing this brief. counsel for party authored this brief whole part, and counsel party made monetary contribution intended fund the preparation submission this brief. person other than Amicus Curiae, its members, its counsel made monetary contribution its preparation submission. The issue presented whether the district court properly enjoined Sections and the Illegal Immigration Reform and Enforcement Act 2011 (hereafter IIREA) from taking effect July 2011. The district court erred finding that Plaintiffs-Appellees Georgia Latino Alliance for Human Rights, al. (Plaintiffs) are likely succeed their claim that each enjoined provision preempted federal law. Preliminarily, the district court erred not applying presumption against preemption. The provisions issue not regulate immigration and are clearly with the State Georgias historic police power. amended, U.S.C. 1101 seq., expressly contemplates State and local governments exercising their inherent police power assist federal government efforts enforcing immigration laws, even absent the conditions contained U.S.C. 1357 and 1103. Section the IIREA not preempted U.S.C. 1324. the context statutes concerning illegal aliens, the U.S. Supreme Court has made clear that Congress did not intend field preempt all State regulations touching immigration. Contrary the district courts ruling, Section not preempted because States may complement federal immigration law where State enforcement activities not impair federal regulatory interests. Nor Section preempted because its provisions are not identical its federal counterpart, different provisions not necessarily equate with conflicting provisions. ARGUMENT AND CITATIONS AUTHORITY Applicable Standards Review The Court Gives Deference District Courts Legal Determinations and Reviews District Courts Interpretation the Underlying Legal Principles Novo. The issue before this Court whether the district court properly granted preliminary injunction with respect several provisions the IIREA. A plaintiff seeking preliminary injunction must establish that likely succeed the merits, that likely suffer irreparable harm the absence preliminary relief, that the balance equities tips his favor, and that injunction the public interest. Winter Natural Res. Def. Council, Inc., 555 U.S. 20, 129 Ct. 365, 374 (2008). Since Plaintiffs were required establish each these elements order prevail their motion for preliminary injunction, this brief focuses solely whether the district court properly found that Plaintiffs had established that they are likely succeed the merits. County, 285 F.3d 1319, 1321 (11th Cir. 2002) (conclusions law drawn district court route granting preliminary injunction reviewed novo). Because preemption legal question, the district courts decision grant preliminary injunction preemption grounds reviewed novo. Id. This Facial Challenge Disfavored and Plaintiffs Bear Heavy Burden. Plaintiffs have never alleged that the State Georgia its agents have taken any action enforce the newly enacted IIREA against them anyone else. Plaintiffs thus raise facial challenge the constitutionality the statute. Consequently, Plaintiffs confront heavy burden advancing their claims. National Endowment for the Arts Finley, 524 U.S. 569, 580, 118 Ct. 2168, 2175 (1998). The U.S. Supreme Court has declared that [f]acial invalidation is, manifestly, strong medicine that has been employed the Court sparingly and only last resort. Id. (quoting Broadrick Oklahoma, 413 U.S. 601, 613, Ct. 2908, 2916 (1973), and citing FW/PBS, Inc. Dallas, 493 U.S. 215, 223, 110 Ct. 596, 603 (1990) (noting that facial challenges legislation are generally disfavored)). State Republican Party, 552 U.S. 442, 450-51, 128 Ct. 1184, 1191 (2008). When legislative enactment facially attacked, court disadvantage because does not know how the law will applied construed enforcing authority. The law might applied construed the enforcing authority way that avoids any constitutional issue. the U.S. Supreme Court has declared, It neither our obligation nor within our traditional institutional role resolve questions constitutionality with respect each potential situation that might develop. Gonzalez Carhart, 550 U.S. 124, 168, 127 Ct. 1610, 1639 (2007). Instead speculating about hypotheticals, courts typically prefer wait until the law construed in the context actual disputes. Washington State Grange, 552 U.S. 450, 128 Ct. 1191. court must careful not beyond the statutes facial requirements and speculate about hypothetical imaginary cases. United States Salerno, 481 U.S. 739, 745, 107 Ct. 2095, 2100 (1987). Co., 337 U.S. 582, 604, Ct. 1173, 1183-84 (1949) (presumption validity prevails unless there clear showing that transgresses constitutional limitations). The Burden Establishing the Unconstitutionality the Provisions Issue Rests Plaintiffs and Never Shifts. It salutary principle judicial decision, long emphasized and followed [the Supreme] Court, that the burden establishing the unconstitutionality statute rests him who assails ..  Metropolitan Casualty Ins. Co. New York Brownell, 294 U.S. 580, 584, Ct. 538, 540 (1935). Even more specific this case, the party claiming preemption bears the burden demonstrating that federal law preempts state law. Silkwood Kerr-McGee Corp., 464 U.S. 238, 255, 104 Ct. 615, 625 (1984). This burden proof never shifts. II. The Enjoined Provisions Are Not Preempted Federal Law. The Supremacy Clause provides that the Constitution, and the Laws the United States which shall made Pursuance thereof; and all Treaties made, which shall made, under the Authority the United States, shall the supreme Law the Land. U.S. Const., art. VI, cl. The preemption doctrine arises from this clause. The Supreme Court has recognized three types preemption: (1) express preemption, where federal statute contains explicit preemptive language; (2) field preemption, where the federal regulatory scheme so pervasive make reasonable the inference that Congress left room for the States supplement it; and (3) conflict preemption, where compliance with both federal and state regulations physical impossibility where state law stands obstacle the accomplishment and execution the full purposes and objectives Congress. This That And The Other Gift And Tobacco, Inc., 285 F.3d 1322 (quoting Wisconsin Public Intervenor Mortier, 501 U.S. 597, 604-05, 111 Ct. 2476, 2481-82 (1991)). preemption case, and this intent governs courts] determination whether federal law preempts state law. This That And The Other Gift And Tobacco, Inc., 285 F.3d 1322 (quoting Medtronic, Inc. Lohr, 518 U.S. 470, 485, 116 Ct. 2240, 2250 (1996), and Boyes Shell Oil Prods. Co., 199 F.3d 1260, 1267 (11th Cir. 2000)). including detaining the suspect, transporting the suspect detention facility, notifying the U.S. Department Homeland Security (hereafter DHS). Id. The district court enjoined these provisions because found that Plaintiffs had established that likely succeed their claim that each enjoined provision preempted federal law. doing so, the district court found that each enjoined provision, its face, creates obstacle the enforcement and implementation federal law. The district court erred, however, Congress intent that states not preempted from enacting such laws could not any clearer. will shown below, the provisions issue are harmony with federal law and, consequently, are not preempted. The District Court Erred Not Applying Presumption Against Preemption. One the cornerstones the U.S. Supreme Courts decisions preemption that all pre-emption cases, and particularly those which Congress has legislated field which the States have traditionally occupied, [courts] start with the assumption that the historic police powers the States were not superseded the Federal Act unless that was the clear and manifest purpose Congress. legislates in field which the States have traditionally occupied [courts] start with the assumption that the historic police powers the States were not superseded the Federal Act unless that was the clear and manifest purpose Congress.) (citation omitted); Gade, 505 U.S. 111-12, 112 Ct. 2390 (Kennedy, J., concurring) (stating preemption must not found absent clear statement intent Congress) (citations omitted). Courts rely the presumption because respect for the States independent sovereigns our federal system leads assume that Congress does not cavalierly pre-empt state-law causes action. Wyeth, 129 Ct. 1195 n.3 (quoting Medtronic, Inc., 518 U.S. 485, 116 Ct. 2250); see also Jones Rath Packing Co., 430 U.S. 519, 525, Ct. 1305, 1309 (1977) (This assumption provides assurance that the federal-state balance, will not disturbed unintentionally Congress unnecessarily the courts.) (citation and internal quotation marks omitted). this case, the district court found that the presumption against preemption should not applied either Section because these provisions regulate immigration, not fields that the States have traditionally occupied. Georgia Latino Alliance for Human Rights Deal, No. 1:11-CV-1804, 2011 U.S. Dist. LEXIS 69600, *30, 46-47 (N.D. Ga. June 27, 2011). The district court wrong for two reasons. The provisions issue not regulate immigration. The U.S. Supreme Court has declared that the fact that aliens are the subject state statute does not render regulation immigration .. Canas Bica, 424 U.S. 351, 355, Ct. 933, 936 (1976). fact, even such local regulation has some purely speculative and indirect impact immigration, does not thereby become constitutionally proscribed regulation immigration that Congress itself would powerless authorize approve. Id. 355-56, Ct. 936. legislative enactment regulation immigration only makes a determination who should should not admitted into the country, and the conditions under which legal entrant may remain. Id. 355, Ct. 936. In other words, the creation standards for determining who and not this country legally that constitutes regulation immigration these circumstances, not whether states determination this regard results the actual removal inadmissibility any particular alien, for the standards themselves are a determination who should should not admitted into the country, and the conditions under which legal entrant may remain. Equal Access Education Merten, 305 Supp. 585, 602-03 (E.D. Va. 2004) (quoting Canas, 424 U.S. 355, Ct. 936). the federal government present the United States violation federal immigration law. See O.C.G.A. 17-5-100(a)(2) (emphasis added). addition, Section does not regulate immigration all. Rather, utilizes the State Georgias ordinary police powers create new criminal offense for any person regardless his her citizenship immigration status who commits the various elements the offense with the requisite criminal intent. Specifically, prohibits any person again regardless his her citizenship immigration status who, the course committing another crime, entices illegal alien enter Georgia, harbors illegal alien Georgia, transports illegal alien Georgia. One obvious example underlying criminal offense which Section likely apply, were allowed into effect, the States anti-human trafficking law, O.C.G.A. 16-5-46. this regard, individual who commits the offense trafficking person for labor sexual servitude (O.C.G.A. 16-5-46(b) and (c)) could also found have committed one the three offenses created Section the victim his her offense illegal alien who being enticed enter Georgia being harbored transported Georgia. Other examples underlying predicate offences which Section likely apply, allowed into effect, include violations prostitution and drug trafficking laws. The obvious purpose Section not criminalize illegal aliens immigration status, but target persons, regardless the citizenship immigration status, who conspire with, enlist, victimize illegal aliens carrying out another criminal offense. Section the type enactment that quintessentially within any states traditional police power. this regard, the district court erred not applying the presumption against preemption because too narrowly defined Georgias traditional police power and the fields has historically occupied. has long been maintained the U.S. Supreme Court that the police power any State nothing more less than the powers government inherent every sovereignty the extent its dominions. License Cases, U.S. How.) 504, 582 (1847). It may said general way that the police power extends all the great public needs. Noble State Bank Haskell, 219 U.S. 104, 111, Ct. 186, 188 (1911) (citation omitted). It may put forth aid what sanctioned usage, held the prevailing morality strong and preponderant opinion greatly and immediately necessary the public welfare. Id. The U.S. Supreme Court has stated that the police power exists for the public safety, public health, morality, peace and quiet, and law and order. Berman Parker, 348 U.S. 26, 32, Ct. 98, 102 (1954). sanctioning businesses that employ illegal aliens based federal immigration standards does not regulate immigration); Gray City Valley Park, No. 4:07-CV-00881, 2008 U.S. Dist. LEXIS 7238, *24-25 (E.D. Mo. Jan. 31, 2008) (State law sanctioning businesses that harbor employ illegal aliens based federal immigration standards does not regulate immigration), affd, 567 F.3d 976 (8th Cir. 2009); League United Latin American Citizens Wilson, 908 Supp. 755, 770 (C.D. Cal. 1995) (hereafter LULAC) (Proposition denying state benefits illegal aliens based federal immigration standards did not regulate immigration); Merten, 305 Supp. 603 (school policies denying  admission illegal aliens based federal immigration standards not regulate immigration).2 The fact that the provisions issue might have some indirect impact immigration does not make them regulation immigration either. Canas, 424 U.S. 355-56, Ct. 936-37; see also LULAC, 908 Supp. 770 (finding that although benefits denial provision might indirectly incidentally affect immigration causing such persons leave the state deterring them from entering California, provision was not regulation immigration under Canas). Section Not Preempted U.S.C. 1324.
cannot complement federal immigration law, and, even they could, Section implicitly conflict preempted because its provisions are not identical its federal counterpart. Id. Under either theory, the district court has clearly misconstrued the applicable legal principles. As every schoolchild learns, our Constitution establishes system dual sovereignty between the States and the Federal Government. Gregory Ashcroft, 501 U.S. 452, 457, 111 Ct. 2395, 2399 (1991). Under our federal system, the States possess sovereignty concurrent with that the Federal Government, subject only limitations imposed the Supremacy Clause. Id. (citation omitted). Hence, while the States have surrendered certain powers the Federal Government, they retain residuary and inviolable sovereignty. Printz United States, 521 U.S. 898, 918-19, 117 Ct. 2365, 2376 (1997) (quoting THE FEDERALIST NO. 39, 245 (J. Madison) (C. Rossiter ed. 1961)). course committing another state offense but establishing that federal law overlaps state law is, itself, insufficient establish that federal law preempts state law. Green Fund Asset Mgmt., L.P., 245 F.3d 214, 228 (3rd Cir. 2001). Indeed, the creation federal [prohibition] does not necessarily eradicate existing state law [prohibitions] require that the federal [prohibition] exclusive. Id. 227 (citing Medtronic, Inc., 518 U.S. 495-501, 116 Ct. 2255-58 (holding that  360(k) the Medical Device Amendments 1976 does not preempt overlapping state tort law). the instant matter, the State Georgia carefully crafted Section promote the public safety, public health, morality, peace and quiet, and law and order (see Berman, 348 U.S. 32, S.Ct. 102) utilizing traditional police powers create new criminal offenses applicable anyone, regardless their citizenship immigration status. Moreover, the extent that the offenses touch immigration status, the State Georgia was careful ensure that the relevant persons immigration status determined and verified federal officials, not state officials. See O.C.G.A. 16-11-200(a)(1), 16-11-201(2), 16-11-202(a). Section not preempted U.S.C. 1324, and the district court erred finding otherwise. Section Not Preempted U.S.C. 1357 1103. The district court held that Section implicitly conflict preempted U.S.C. 1357 and 1103 because allegedly these federal statutes specifically enumerate the only conditions under which state officers can aid immigration enforcement. The district court stated that Congress has provided that local officers may enforce civil immigration offenses only where the Attorney General has entered into written agreement with state, U.S.C. 1357(g)(1), where the Attorney General has expressly authorized local officers the event mass influx aliens. U.S.C. 1103(a)(10). Georgia Latino Alliance for Human Rights, 2011 U.S. Dist. LEXIS 69600, *24 (emphasis added). The district courts implied conflict preemption argument based solely the maxim statutory construction expressio unius exclusio alterius (the expression one thing the exclusion another). other words, when Congress granted arrest power State and local peace officers certain circumstances, impliedly precluded the exercise that power all other circumstances. Authority arrest. officer person shall have authority make any arrest for violation any provision this section except officers and employees the Service designated the Attorney General, either individually member class, and all other officers whose duty enforce criminal laws. taking other action enforce this nations immigration laws. ); Marsh United States, F.2d 172, 174 (2d Cir. 1928) ([I]t would unreasonable suppose that [the federal governments] purpose was deny itself any help that the States may allow.). Section not preempted U.S.C. 1357 1103, and the district court erred finding otherwise. Because Sections and the IIREA are not preempted federal law, the district courts grant preliminary injunction should reversed and vacated. Pursuant Fed.R.App.P. 32(a)(7)(C), hereby certify that the foregoing Brief Amicus Curiae Judicial Watch, Inc. Support Appellants complies with the type-volume limitations Fed.R.App.P. 32(a)(7)(B). The brief was written point-Times New Roman font and contains 5,613 words, counted Microsoft Word 2011. Sr. Assistant Attorney General Capitol Square, S.W. Dale Schwartz     Pickens Andrew Patterson, Jr.